Welcome... Thanks for stopping by for another Tuesday's Treasure. No doubt about it. 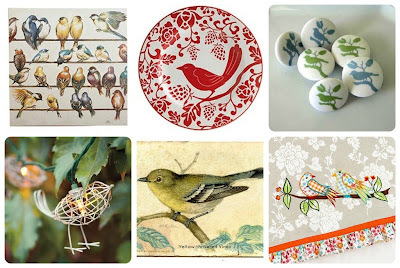 I love searching for little birdie things. I found this adorable bird vase at a thrift store for $1.80 last month. I think I'll stop in today to see if there are any more items. Their prices are dirt cheep. Do You Know the Way to Orca Bay? Remember the tune Do You Know the Way to San Jose? I think I hummed and sung my way to this tune while making my Orca Bay Mystery Quilt. Not really it just came to me because I needed a blog title and it rhymed. I was only 7 years old when this song came out, but its such a classic. I love it. I remember singing it as a kid. I like singing in now as a matter of fact. My quilt top is done. It's a biggie. It's got some mistakes. Some string blocks going the wrong way. But that's okay. This quilt has approximately 3,844 pieces. It is 74 1/2" x 84 1/2." I started it around December 1st ish and finished it the night before my bee meeting on January 4th. I just blew through my stash with this one. I hardly have any neutrals left. And reds ~ well they are pretty much gone too. After this Orca Bay Quilt and another quilt that will be in the GO! 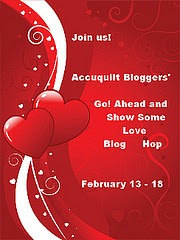 Ahead and Show Some Love Blog Hop there's not much red left. 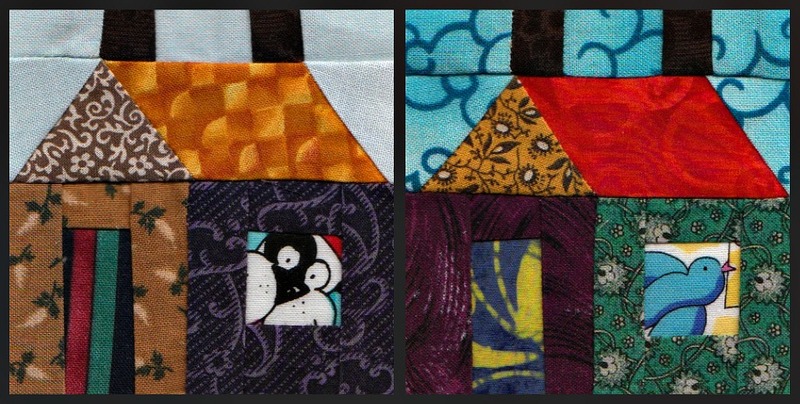 This mystery pattern won't be on Quiltville forever, so if you want it, get it now before Bonnie takes it down. Someday it's gonna be in a book. I bet! I can't show it to you yet. Sew Cal Gal's "GO! 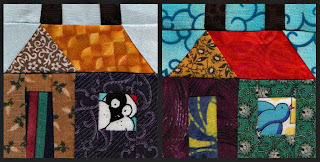 Ahead and Show a Little Love"
Here is a sneak peek at my tutorial. It will use the die set that came with your GO! cutter system. There are 74 compatible dies that work with the GO! It starts on Feb. 13th and goes to Feb. 18th. 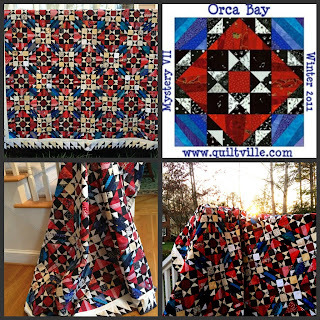 Thanks to Paulette (Sweet P Quilting) for coordinating this Blog Hop for those that enjoy creating with their AccuQuilt, as well as those interested in learning more about quilting using die cutting tools. ~Stacey (Driving Miss Stacey) ME! It's been raining along the eastern seaboard for three days now. There's nothing like a nice cup of hot tea to take away the afternoon chill. 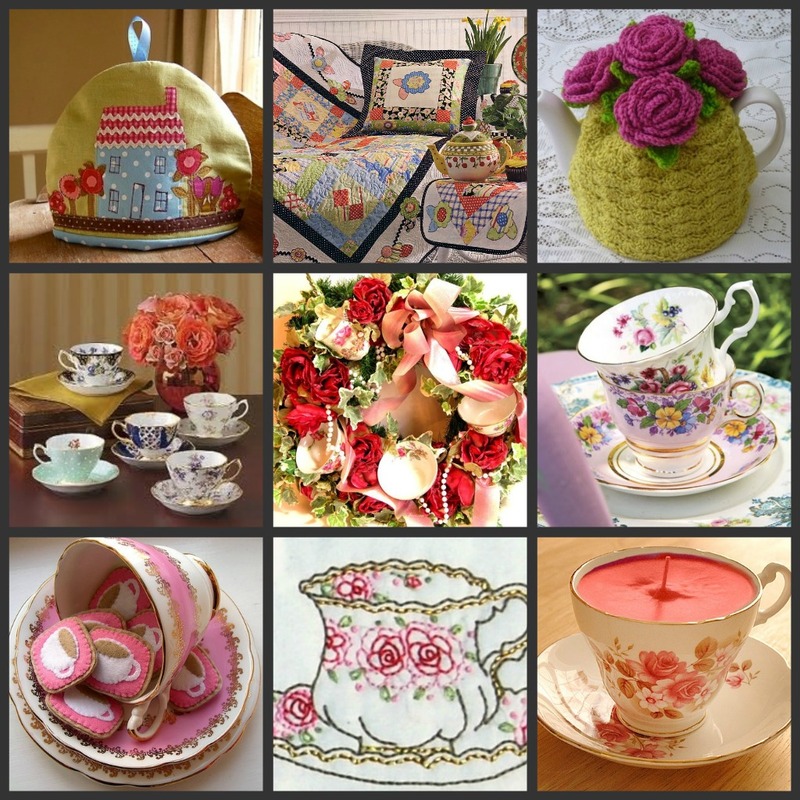 I started collecting teacups, teacup fabric, embroidery, aprons, vintage postcards and greeting cards. I found this neat selection on-line visiting some of my favorite websites. Another week and I have another special treasure to share with ya'll. 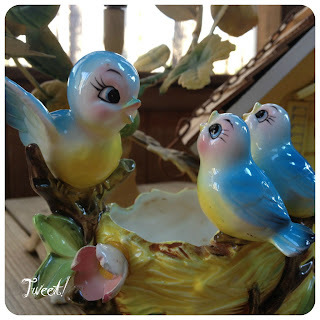 I am linking up today with our lovely host Melody for Tuesday's Treasure. Why not join us and share your Treasure? This is my super duper heavy cathedral window quilt that my mom made for me when I was a senior in high school (some 33 years ago). 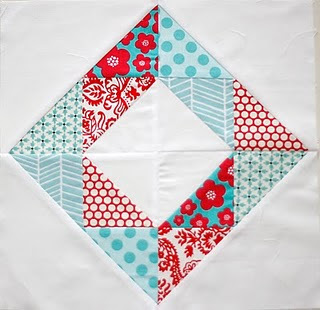 She was not a quilter. This was her first and only quilt that she every made. I can't even imagine tackling such a big and complicated quilt for my first project. I remembering going to the closest JC Penny in our city (See, I am a "valley girl"! I grew up in a suburb in the San Fernando Valley of Los Angeles. I can totally remember that "Valley Girl" song) Anyone else remember it? Upstairs we would march. On the second floor was the fabric, crafts, lingerie and the Girl & Boy Scout Sections. My brothers and I would hide among the racks of clothes. Causing the sales ladies much angst I would suspect. She would buy pieces of fabric for .10 to .25 cents each. I remember that flat fold table like it was yesterday. 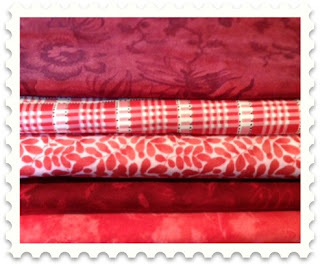 She would dig and dig until she found a great variety of fabrics. The store had wooden floors. I loved the sound of my shoes on that floor. One year I took a small piece that I found and had it framed and gave it to her as a gift. It's been in my attic here in North Carolina for 18 years. The glass broke on the frame and it is a bit dusty but it gets sweeter each time I look at it. 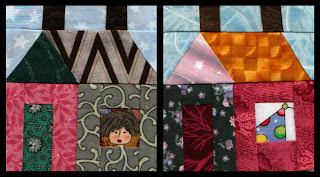 Cathedral Window is a traditional patchwork technique interpreted in old quilts as rows of folded squares of off-white or cream-colored muslin with assorted fabric squares in the windows. 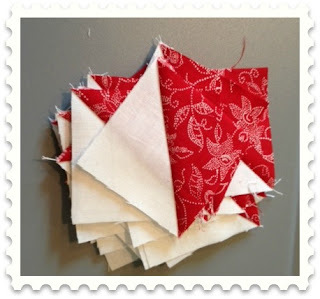 It requires about four times its area in the folded squares, so a large amount of fabric is needed for the base of the quilt. Because of the four folds involved in each of the blocks, the resulting quilt also tends to be heavy and therefore does not require batting (or backing) or any quilting. Due to its delicate construction, it is often used more as a bedspread than as a quilt itself. 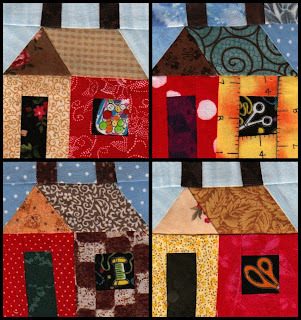 This a great if you are part of a sewing circle or a quilter's group and are constantly on the move with your quilt. 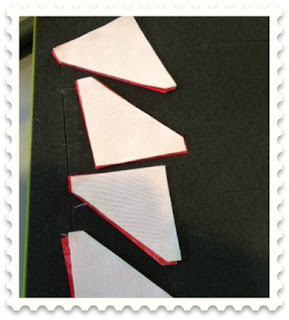 You can iron all the pieces before hand and sit very comfortably for a couple of hours while you sew each piece together. This is a lot easier than trying to carry around a full queen-sized quilt and sew the whole thing together. It seems like it's actually quite a portable project. Maybe I'll try a small one. 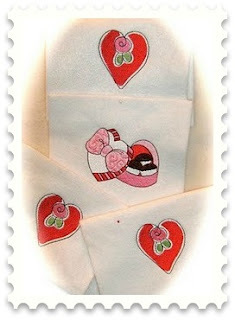 Along with my once-in-a-lifetime Grandmother's Flower garden quilt that I am working on. Have you ever seen such a crafty neighborhood? Everyone here in this neighborhood either sews or quilts. This week I decided to put little quilting or sewing gadgets in my windows. I have made 23 houses so far. I prefer to make 7 or 8 of them per day. Sundays are best. Cold winter days when I just don't want to go outside. I am caught up and have a few days to spare. 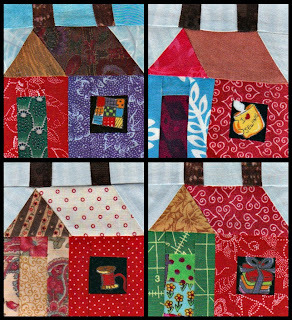 Building Houses from Scraps can be found here. I have decided to share with ya'll treasures that make me happy. 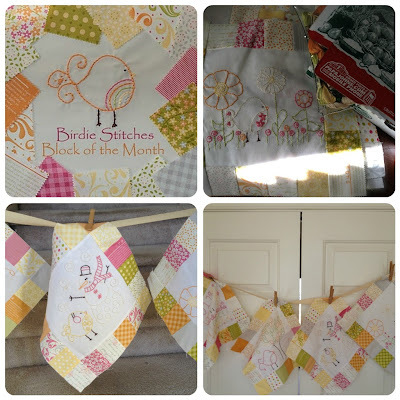 Every Tuesday I'll post something that I may have here at home, something I may find when I out and about in my search for vintage sheets or maybe one of the quilting projects that a member of my bee has made that just has me in awe. That happens a lot. I really don't know what I'll post. Stay tuned and check back on Tuesdays. Melody over at The House on the Side of the Hill has inspired me. 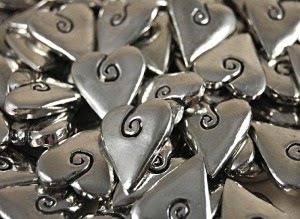 For this week it is my heart pocket charm. I bought 3 of them 11 years ago when my mom was very sick. I gave one to each of my daughters and one for myself. Just as a reminder that when you slip your hand into your pocket and feel the heart, you'll have nice thoughts, know that you are thought of and have a nice remembrance of something in your life that makes you smile. I kept mine in my pocket or purse. It got lost a few times. Put into my jewelry box, put back into my pocket again, found on the bottom of the washing machine. Put away again. In and out many times. Fast forward about 6 years. I found it!! In my coat pocket yesterday. On a dreary gray day, it was a nice feeling. I finished my first UFO yesterday. 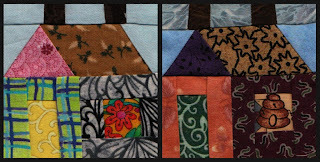 My Mini Double House Glass quilt. 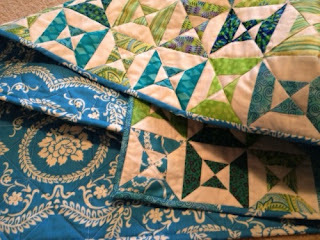 Yesterday was one of those stay inside, sew and quilt days until you can't sit or see straight anymore. One UFO bites the dust. 23 more to go! I got it down now. Each house takes about 10 minutes. I got 6 done this week.